In 2016, Oklahoma began teaching more comprehensive academic standards, which required a new, more complex Oklahoma School Testing Program (OSTP) assessments to measure them. The new tests were given to students in the spring of 2017 and the cut scores or proficiency levels for the tests were reset to reflect the new rigorous standards. Superintendent Dr. Sean McDaniel said he wants to prepare Mustang families for changes within the state testing program before scores are released this semester. McDaniel stressed that state testing is only one measure of the academic health of a student, school or school district, but they’re necessary and provide valuable information. One measure for states to evaluate the success of their students is the National Assessment of Educational Progress (NAEP). This test is given to a sampling of students in districts across the United States every year allowing states to see how their students compare to students across the country. In 2012-2013, for example, there was a 42 percent decrease in how well Oklahoma students performed in 8th grade math on the state assessment versus the NAEP. 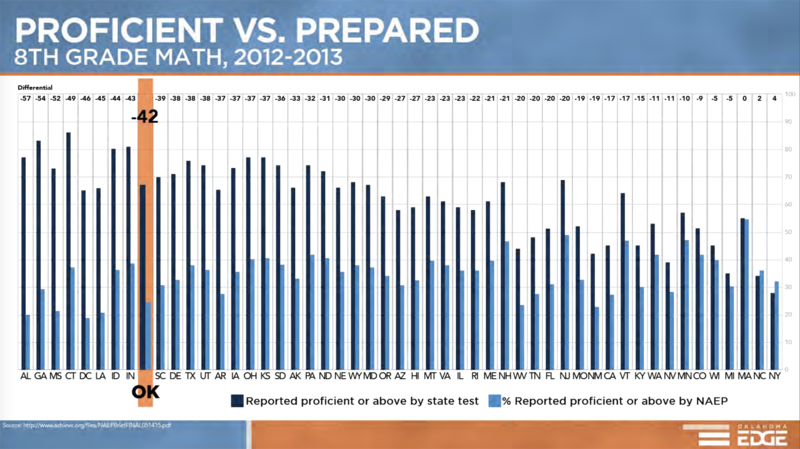 Forty-five states have raised their standards for student proficiency in reading and math since 2011. The new assessments also align with national benchmarks like the ACT and SAT. McDaniel stressed that the results coming out this month for schools and those for individual students at the end of November are considered “baseline” scores. They are the first scores for the new testing system and must stand alone; they cannot be compared to the results from any test that came before and represent a total reset of the testing system. Oklahoma schools will receive their results this month. Individual test scores are expected to be released at the end of November. There was a significant difference in student success rates on Oklahoma’s state tests versus national tests. 39 percent of Oklahoma students in 2015 had to take remedial classes in college, which greatly increases the likelihood that they will not graduate. A task force put together by the Oklahoma State Department of Education made recommendations to 1. provide a measure of performance in grades 3-8 that would indicate whether a student is on track for college and career readiness (CCR) and 2. to utilize the National Assessment of Educational Progress (NAEP) data to establish statewide comparison in grades 4 and 8 and to raise the bar on standards to the national level. Therefore, comprehensive science, math and ELA standards were put into place. Teachers have only had ONE YEAR to teach the new standards. A much more difficult assessment was given in 2017 as students are held to a higher standard to better prepare them for college and careers. Changes involve an increase in “Depth of Knowledge,” a term used to describe the complexity of a learning task. For the test results, which will be released to parents at the end of November, no comparison is available to previous years. Don’t panic. Scores will improve over time as the state educational system settles into the new standards.